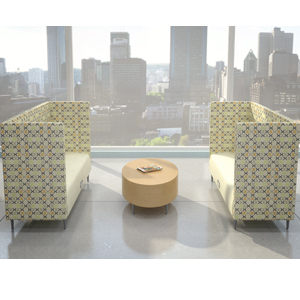 A major expansion of our already extensive and award-winning Zola collection, Zola Privacy takes public seating and collaborative workspaces to a new level of function and sophistication. It’s a modern solution for modern people spaces: wherever people are working, collaborating, learning, receiving care, eating and drinking - Zola Privacy creates space that artfully accommodates groups, teams and multiple users with exceptional comfort and style. Now with three back heights (34”, 38” and 50”) in both curved and rectilinear forms, Zola offers almost unlimited configuration for a multitude of applications: reception spaces, waiting areas, meeting space, library settings, and more. Zola Privacy can be specified with seats on one side of the back or on both sides, to optimize available space and create varying degrees of privacy within public space. 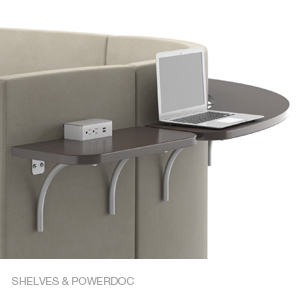 And it’s an ideal solution for work teams and study groups, with an array of complementary tables, back-mounted shelves, privacy screens and Zola Seatables that can be combined to complete the setting.